In order to be ready to learn, students need to be well-nourished. 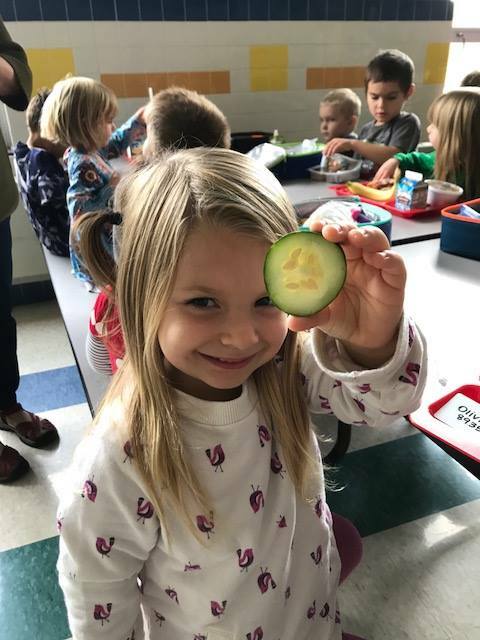 The Trumansburg Education Foundation has made it part of its mission to support nutrition education activities for students through our Wellness Program. Each October, Pre-K through Grade 4 students enjoy a free salad, funded by the Trumansburg Education Foundation. Students are encouraged to choose at least three vegetables of different colors for their lunch. In 2017, there was lettuce, corn and beans, tomatoes, peppers, candy stripe beets, cauliflower, broccoli, watermelon radishes, carrots, and cucumbers. Special thanks go out to the Trumansburg Elementary Food Service staff for their extra efforts with this wellness program. During the “Big Apple Crunch”, students all over New York State bite into a fresh, local apple from a New York State orchard at the same time. 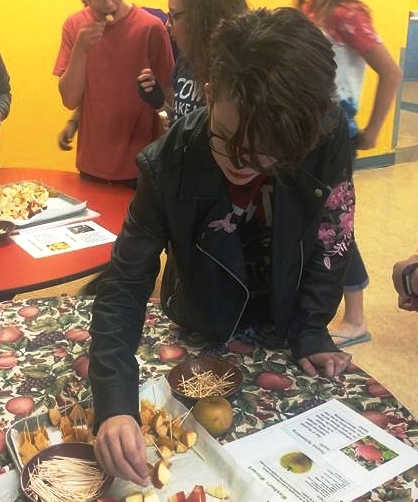 Trumansburg students are lucky to be surrounded with an abundance of apple orchards, and this year, students got to taste samples of heirloom apples from Black Diamond Farm in the Middle School, and also Cornell’s newest introduction, “Snapdragon” and “Ruby Frost” in the High School. The Trumansburg Education Foundation purchased additional local apples to make sure all students in the district had one to eat at the designated time. The Big Apple Crunch is just one example of farm-to-school activities supported by the Foundation, helping kids connect to local farms and fresh food in our area. In 2017, students in the Middle School got to sample sautéed kale grown by fellow students after school, and served by Dave Gell and Sarah Glenn. Trumansburg students in all school buildings will be invited to sample more tastings of fresh local food starting in January 2018 during their lunch periods.